Trout are trying to put weight on for the winter and are more aggressive. Pictured: 11.5 lbs trout caught on Ootsa Lake using a black Apex. Coho fishing is done. Some winter Chinook being caught and Halibut fishing has been good. 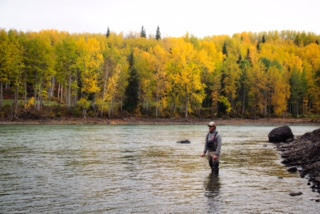 Bulkley River is excellent. Steelheading has been awesome and the water levels are great. Morice has been slower. The fish are in but fishing has been tougher. Water level has come up and is a bit cloudy. Steelheading has been good. Coho fishing has been excellent. Lots of fish weighing in the teens and some in the 20lbs. 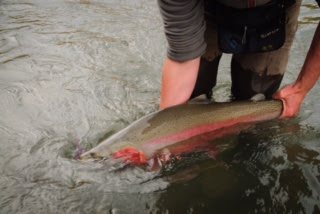 Skeena is coloured but fishable. 15lb Coho caught recently at China Bar. 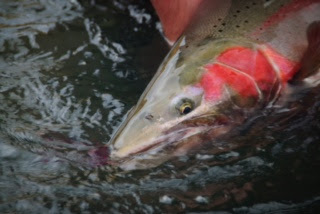 Steelhead being caught throughout. Patagonia Gear Night: Tonight, 6:30, in the store. 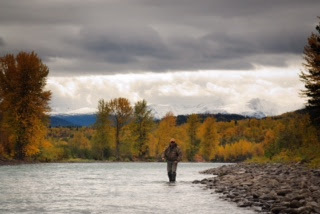 There will also be a talk on the Proposed Catch and Release Study on the Steelhead in the Bulkley River. Copyright © 2015 Oscars Source for Adventure, All rights reserved.